SCVHistory.com LW3000 | Film-Arts | Tex Williams Stars in 'South of Santa Fe' (Universal 1949). 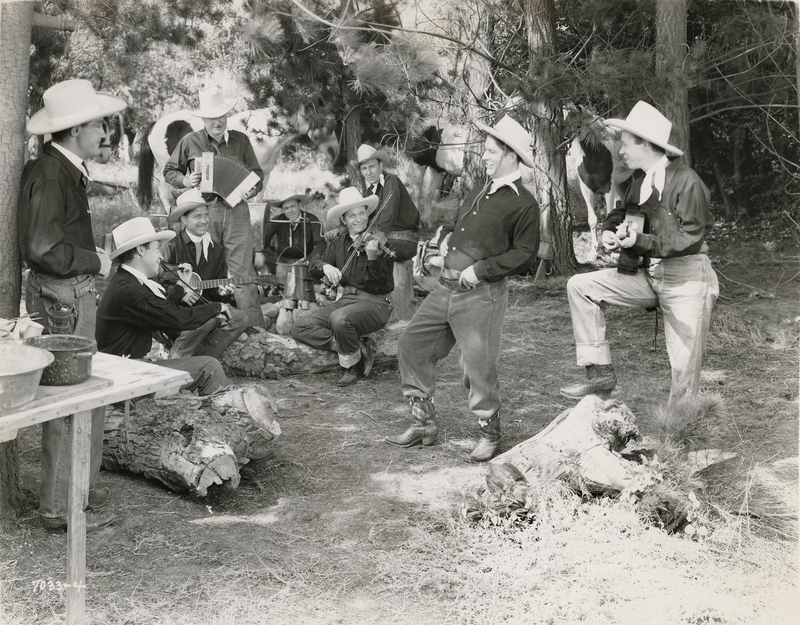 Western singer and eventual Newhall resident Tex Williams stars in the 1949 musical short feature from Universal Pictures, "South of Santa Fe." ... Not to be confused with the 1932 full-length feature of the same name starring Bob Steele, or the 1942 version starring Roy Rogers — both of which were filmed in Placerita Canyon. "South of Santa Fe" seems to have been a popular name for movies with an SCV connection. This 8x10-inch glossy print, a publicity photo, was in the Neil Summers Collection. Summers, an actor-stuntman from Utah ("The Shawshank Redemption," "Glory," "Mars Attacks!") owns one of the world's largest collections of Western movie memorabilia. In this photo, Tex Williams is leaning against the tree at left. We don't know where this picture was filmed; many of Williams' 1949-1950 musical shorts for Universal were shot elswewhere in the L.A. area. Produced and directed by Will Cowan, the picture features a cast of Eugene "Smokey" Rogers, Deuce Spriggins, Donna Martell, William Tannen, Kenneth MacDonald, Ethan Laidlaw and Harry Calkin. Williams, Smokey Rogers (from Spade Cooley's band), Deuce Spriggins (Sons of the Pioneers) and others performed as The Western Caravan. LW3000: 9600 dpi jpeg from original photograph purchased 2017 by Leon Worden, ex-Neil Summers Collection.